The Nelson Ball Criss-Cross Bubble Pendant is part of the Nelson Bubble Lamp series, a group of lighting fixtures in charming spherical shapes. The criss-cross pattern of the lamp’s structure adds an interesting dimensionality and soft light to any interior. George Nelson, inspired by a set of silk-covered Swedish hanging lamps, designed the series in 1952. 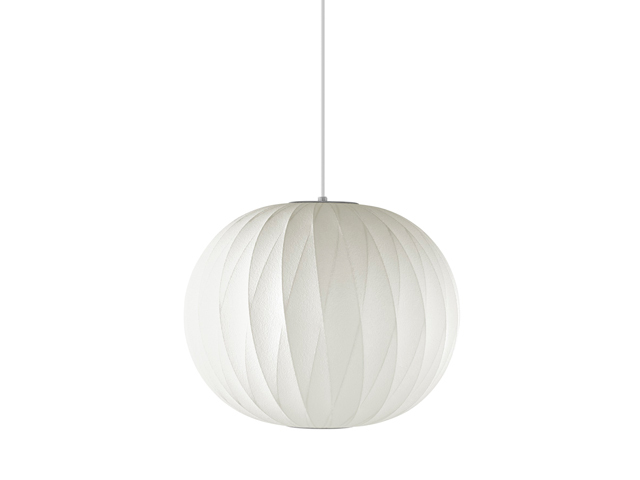 The Nelson Bubble Lamps are a versatile and unique addition to any interior with their various spherical shapes. The perfectly rounded shape of the Nelson Ball Criss-Cross Bubble Pendant has an interesting contour due to the bisecting pattern in its under-structure. In 1952, Nelson was inspired by set of Swedish hanging lamps that were tediously crafted with a silk covering. The bigger challenge, however, was their expensive price. Nelson decided to make his own set, and arrived at an innovative process that replaced the silk shade with a translucent plastic material, making them available at a modest price. Complete with a nickel-plated steel ceiling plate and a 6-foot cord.